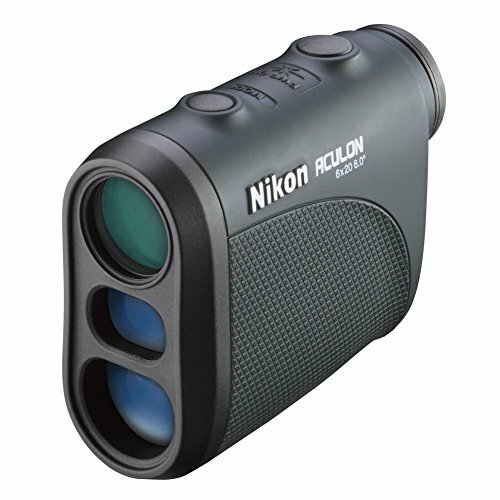 Nikon is the world leader in optics and is on the cutting edge of laser rangefinder technology. The new ACULON Rangefinder delivers world-class performance in an extremely compact body. Nowhere else will you find the speed, the precision and the optical quality of the palm-sized ACULON. The ACULON rangefinder is small enough to fit in almost any pocket or pack. It is the ultimate, take-everywhere rangefinder. Multilayer coatings provide an even higher light transmittance across the entire visible light spectrum. This minimizes the loss of light due to reflection, thereby ensuring a more natural, clearer view. Nikon has manufactured the ACULON rangefinder, as well as many other of their optics, with a high-eyepoint design. This provides a clear field of view for everyone even with sufficient space between the user’s brow and the rangefinder. This provides a full field of view when ranging targets even when the user is wearing eyeglasses. For fast, easy measurements, the single button operation of the ACULON rangefinder is simple to use and automatically powers down after 8 seconds to reduce battery use. The ACULON rangefinder is conveniently programmed to display the range of the furthest target among a group of targets measured, which is particularly useful when the subject is partially obscured by grass or brush.